Finally Seventeen has learned their demographic. We should be teaching the younger generation about fiscal responsibility, especially in this economy. Why would a magazine catering to young women promote products and clothing they can’t afford? The $20 dress is just as great as the $200 one. Granted it would have to be a great dress for $20 as I tend to pay more around $15, but I’m a couponer and I take advantage of sales. That’s what we should be teaching the younger generation. 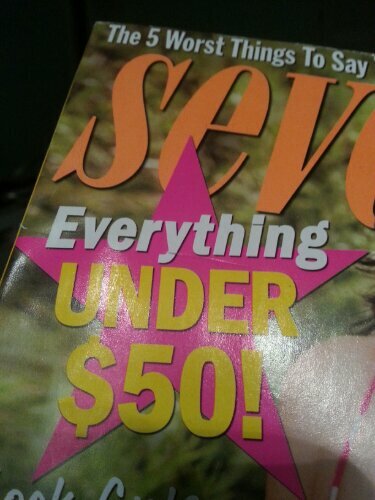 I’m happy to see Seventeen including the occasional coupon and less expensive items in their magazine. Now if we could just get the others on board. I have tons of free magazine subscriptions, which is causing some clutter issues. I can’t stand the idea of throwing issues away once I’ve read them. It just seems wasteful. I keep the All You, Everyday with Rachel Ray, Cooking Light and Everyday Food because they have great recipes that I want to try. But I really don’t need to keep back issues of US, OK and Latina (which I get solely for the coupon inserts). So today I packed them up and dropped them off at church in a donation bin for the nursing home. I also added in issues of Food and Wine I had. Just because you’re in a nursing home doesn’t mean you don’t enjoy food and wine. And I’m sure some elderly person would love to read about Jennifer’s relationships or who wore it best. Right? I really hope whoever takes them to the nursing home agrees or else I may show up to church and hear all about the crazy magazines that were in the donation bin. I mean not everyone wants to read Nat Geo, OK? I absolutely love this magazine! It’s amazing. Not only does it have recipes in it that you’ll actually use, but it also has different teaching articles. One this month is all about making the best spaghetti. It goes over how much you should make depending on the amount of people you’re feeding, but it also goes over the best way to prepare it. It’s great and I got a free subscription using my Recyclebank.com points. Awesome, even if it from Martha Stewart’s company. Do people really believe this crap? Jen said no to Justin, Rhianna is prefabricated, Casper is gay. I mean come on. I’m confused as to how this stuff can be sold as journalism. At least the National Enquirer has aliens and Elvis. Plus I’m pretty there might be a crossword in there. I got this magazine through a free subscription so I’m not paying for it at least, not that I ever would. A new magazine came in the mail yesterday. I get all of these free magazine subscriptions because freebie blogs I follow post links to them all the time. “Everyday Food” came for the first time yesterday and “OK” came today. I’ll probably get more use out of the food magazine because I love trying new recipes whereas I’m not that into tabloids. I used to be super into them a few years back, but that was before I learned that most of what’s printed is total crap. As an actual journalist (as in employed by a real newspaper) I’m appealed that these people get paid to make things up. In my business there is no such thing as an anonymous source and that’s all tabloids use. Anonymous source is basically synonymous with made up quote, except in legal situations and then the source is still given some reference, but not enough to specifically name them. Plus, tabloids employ paparazzi, many of whom will go so far as to stalk a celebrity’s toddler at school to get a shot. That’s sick. So I think I’ll actually read the food magazine whereas I’ll just laugh at the ridiculousness that fills the pages of the tabloid. Lately, I’ve been racking up the free magazines. If you follow freebie or coupon blogs, you can find offers for all sorts of great things. I’ve gotten four full one-year subscriptions to magazines, including Shape and Everyday With Rachel Ray. I know of at least two more that should be coming, including Everyday Food, which I scored free today via Recyclebank.com. It’s a website where you learn about tons of different green things and earn points. The points can then be used to purchase a variety of rewards.